So, I got the Sewing bug 5 new things I learned! I have been sewing like crazy for my new grand baby coming in September and I have really surprised myself with the things that I am able to do. I have made blankets, burp cloths, sheets, changing pad covers and even a little dress for her. I leaned to sew when I was in junior high school, and I made a few things. When my oldest grand daughter was born I made her some skirts over t-shirts and that seemed really difficult at the time, but they were really easy and so very cute. My mother was an amazing quilter and seamstress, I wish I would have paid attention a little more to her when she was alive and trying to get me to sew with her. The things that I have had to learn on my own have been a little elementary. The following 5 things are the top of my list. When you are using scissors for fabric, do not ever let them out of your sight! My husband and kids have all used my fabric scissors for paper and now I have had to buy a new pair because it dulls them so quickly. Don’t try to go it alone. There is so much out there to help you, from youtube video tutorials, facebook groups, even blogs that have a ton of tips and information that will save you time and money. If you are going to cut a bunch of straight lines or boxes, it is worth it to invest in a rotary cutter and cutting mat. I could not believe how much better and easier is has been to get great straight seams when actually sewing on a straight line. All fabric is not created equal, not all quilting cotton is the same, some is much thinner, and some is too thick to sew a couple of layers with. Look at the fabric well before you buy it, make sure it is not too thin to use for what you are making. Just because it is the right color, does not mean it is the right fabric for you. Finally, do not be afraid, sewing is fun, and in the beginning it is so much easier to just expect to make mistakes. It is very much like anything else in life you need to practice and pretty soon it becomes easier and easier. So, my questions to you are do you sew? 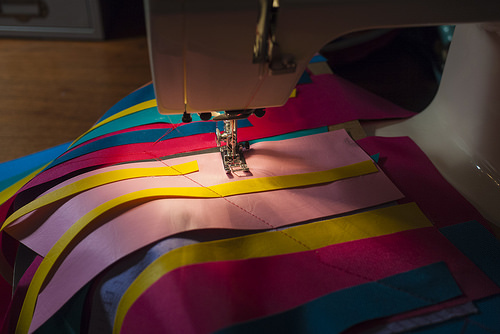 Do you know how and have a sewing machine, but don’t use it? Why or why not? If you do sew what tips do you have for new sewist or even those that are starting again after a long break? I would love to see your projects! I have a new grand baby coming and I am sure if you are a regular reader of my blog you know that. I am just a bit excited! My son and his wife have a very small area to put everything so they opted for a mini crib with a changing table attached. Here is a link to it on Amazon. So my daughter in law has also decided she wanted to do the baby’s things in The Little Mermaid, which as you probably know is almost impossible to find for babies. No blankets, towels, bottles, nothing is decorated with The Little Mermaid. This leads me to my newest sewing adventure. My mom could sew very well, my grandmothers have both made their own clothing for years, my experience was a pair of pajama bottoms and a tote bag in home economics! I have my own sewing machine my grandmother bought it for me for my birthday last year. (she was probably sure I would have a use for it someday) She was right. I went to my local craft store and to Walmart to gather my supplies. I bought cotton fabric, and flannel, and thread and even a pair of fabric scissors. (SCARY MOMENT) I went to Walmart and bought a bunch of 97 cent towels to put in between the cotton. My daughter in law bought this cute skull fabric in fat quarters, so that was the one I had photo help with! First thing I did was to take the hand towel and cut the binding off of the bottom, I then cut the towel in half lengthwise. I cut two rectangles of the print fabric and two rectangles of the plain fabric one inch bigger all the way around. I sewed three of the sides together and then turned them right side out. You sew them together right sides facing so when they are turned they are the right side showing. Now as you see in the above photo I am a pure NOVICE when it comes to sewing. You will notice the edges do not line up perfectly and that I must have a little seam guide to help me stay sewing straight. Trust me when I say with this project close is close enough! Alright you can see here that I have it sewn on three sides and then I turned in right side out and pressed it so that all the wrinkles were out. I then put my half of a hand towel inside of this pocket. When the towel was flat, and let me tell you that was no easy feat, I folded in the fabric and pressed it so I would be able to sew it without having to constantly restuff it inside. (Here is a little hint here, make sure that the towel is inside the pocket and when you sew it on the fourth and last side trim the towel a bit if you have to, but make sure you are only making a seam on the actual cotton and not the towel. My machine got jammed when the towel was in the middle). You simply topstitch this last seam and you are done!! EDIT: MY good friend read this tutorial and said you need topstitch all the way around the the burp cloth, otherwise she says when you wash it the towel will clump into a corner and never be the same! Thanks Jen! How easy it was, and I have made about 10 of these burp cloths for her to use with the baby. I also made two crib sheets in The Little Mermaid print, and a changing pad cover to match. I will try to put up some tutorials for those as well. I am really enjoying myself, and I hope this tutorial helps you know that you can do something really neat for your baby or as a gift for someone else. Enjoy! Please show me if you have made some, I would love to see them and if I can answer any questions on what I did feel free to ask.